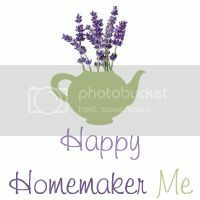 Welcome to Happy Homemaker Me's Pinterest Party! Is this your first time joining us? You can read more information about our Pinterest Parties here. This month, I decided to try my hand at making homemade nursing pads. As a breastfeeding mom for more than 8 months, I've been realizing lately exactly how many disposable nursing pads I've gone through since Kayleigh was born--even before she was born! Not only have they been piling up somewhere in a landfill, they've also been emptying out my wallet. I hate how expensive disposable nursing pads are, but I've also been turned off of buying reusable ones because of their ticket price, as well. Then, I landed on this pin which has been circulating through my mommy-friends' boards lately. Look how easy that is! 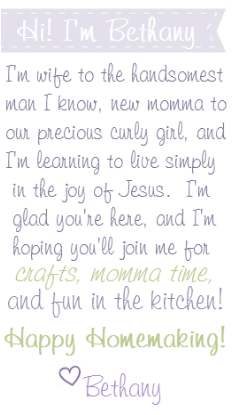 I have enjoyed following Lindsay's blog for years and learning from her homemaker's heart. If you haven't read Passionate Homemaking before, please go visit! She inspires me to want to make more things for my family from home, instead of buying them at a store. She also has three beautiful little kidlets, and a wonderfully Christ-centered marriage with her husband, Aaron. Her tutorial for homemade nursing pads is so simple! I whipped up two pairs within 10 minutes, and I'm so excited about them! They've washed and worn beautifully, so I'm ready to make more. Obviously, these aren't to be worn under my white clothes, with such bright colors! But the pink fleece is what I had on hand, and the cupcake flannel is from the smallest receiving blanket the world has ever seen. Lol, at 16x26 inches, there wasn't much that it covered, so even though it came with a matching outfit, we never used it for Kayleigh. Maybe I can use what's left to make a little lovey for her :) Now that I know how easy these are to make--and how well they hold up--I'm excited to make some more! Now it's your turn! What have you worked on this month? Share your pictures, victories, fails, inspirations, or simply things that you want to try! I will have to take a look at those nursing pad instructions. A friend gave me some reusable pads when I was pregnant, and I bought a few more early on, but with the shared coin op laundry they keep getting lost. I like the receiving blanket idea, too... i think I have about 20 of those. Lol, with 20 receiving blankets, you could be set for life! ;-) We have way more than we could ever use, too. Plus, flannel can get expensive by the yard. I LOVE projects where I don't have to go out to buy a single thing! p.s. I hear you on the coin-op. They have made me believe that the Missing Sock Monsters really do exist! I only joined Pinterest last week, and I'm already overwhelmed thinking about how many things I've pinned but don't really have time to do. Next month, I'll definitely participate in this so I can start working my way through my pins. Oh my goodness! I didn't realize you weren't using reusable pads! I got some from 7Slings for free I just had to pay shipping and I hardly ever used disposable. I'm about to do a series of posts regarding being an exclusive pumper and I'll have to remember to tell people about reusable pads...I'll try to link everyone back here in the event they want to make their own! I love my homemade ones. They're so soft, and even though the appearance screams "little girl," I think they're really cute! I'll be interested to read your series! I've been working on a BFing series too, but it's not quite ready yet.